The risk of catching fatal Legionnaires’ disease from air conditioning units has been dramatically reduced, thanks to a new biophotonic light sensor that spots Legionella bacteria 240 times quicker than methods used today. Outbreaks of Legionnaire’s Disease, a respiratory infection that can cause pneumonia, and in severe cases organ failure or septic shock, are more common than we might think. With anyone being susceptible, more than 100 cases are reported each week both in America and in Europe, with a fatality rate of around 10%. Naturally occurring in freshwater lakes and rivers, the Legionella bacterium is harmless in small enough quantities, but problems start when it multiplies in plumbing systems, air conditioning units, Jacuzzis, decorative fountains or in a public water supply. Here it can be transmitted to humans when it condenses into droplets of fine mist which are inhaled and then settle in the lungs. Roughly 5,000 cases are reported in the United States every year, while 2013 saw 5,851 cases reported by 28 EU Member States and Norway, according to the European Centre for Disease Prevention & Control (ECDC). 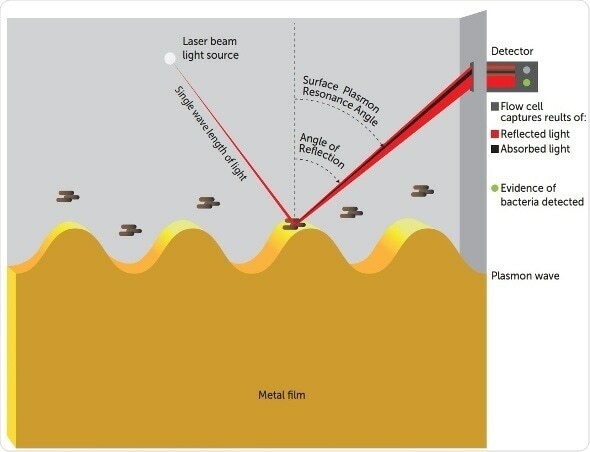 The European group POSEIDON, (or ‘Plasmonic-based automated lab-on-chip sensor for the rapid in-situ detection of Legionella’) intends to change all this, having developed their scanner to spot the deadly Legionella bacteria in under one hour, a process that normally takes 10 days of cultivation and analysis. Equipped with tiny sensors, the device works by using the photonics technique of Surface Plasmon Resonance (SPR), a procedure that reads information from a refracted laser beam, allowing fast, highly sensitive, inexpensive detection from a small sample without the need for ‘labelling’, the process of binding to a protein in order to be detected. SPR occurs when polarized beams of light hit a metal film at the interface of two media. A charge density oscillation of free electrons (or “surface plasmons”) at the metal film occurs, reducing the intensity of reflected light. The scale of the reduction depends on the substance on the metal at the interface. Information then gathered from the refracted can then be analysed, and a pre-programmed pathogen confirmed, resulting in an unambiguous detection of the bacteria in situ. POSEIDON is a first for detecting Legionella with light and provides an inexpensive, user-friendly, state of the art early warning system on an air-conditioning unit. We aim to reduce the time involved in a diagnosis from 10 days to less than 1 hour. In order to prevent outbreaks at critical times of the year, we should be talking about a matter of minutes, rather than days. “Cells remain intact throughout the whole fluid transportation system in the device, and do not adhere to the fluidic piping and microfluidic channels. Virtually all of the bacteria cells in the sample are delivered to the sensing unit, giving extremely high sensitivity and specificity,” said Pierobon. “The exciting feature of this device is that with future development, it could be recalibrated to look for other pathogens, which would provide incredible safety options for the environmental, medical or food industries,” Bellò said. Earlier last year the POSEIDON consortium received funding of €4,068,781 from the Photonics Public Private Partnership, via the European Commission’s H2020 program for a three year research project. Coordinated in Italy, POSEIDON is comprised of a number of European partners, including Protolab, Clivet, A.R.C (Italy), Catlab (Spain), Metrohm Applikon (Netherlands), and Uppsala University (Sweden).